The moon hid its face from us that night, leaving the sky looking as black and inky as the depths of the forest or the surface of the lake. A far cry from the oiled lamps and the golden splendor of our walls. Light and shadows danced along the edge of the bonfire. I stayed close to the whispering voices, to the safety of the small group huddled together trying to keep warm. We looked so out of place, my sisters and I, the hem of our full skirts becoming muddied and grass stained. My eldest sister, Kara, had already lost several pins from her hair. 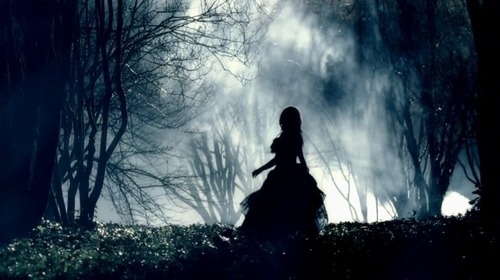 She stood like a crazed silhouette against the heavy fog, curls falling, the cap sleeve of her gown slipping from her right shoulder, one shoe on and one bare foot touching the ground. The music started then, as if cued by her voice. A slow buildup of drum beats, thudding, pounding, weaving a mesmerizing rhythm in the abandoned forest. My eyes slipped closed. My body swayed. The music swelled like a fever within me. My feet moved, first one then the other, until I danced circles around the bonfire, my hands to the sky. Time ceased to exist when we escaped into the forest. All we knew was the drumbeat, all we felt was the dance. There was no hunger or cold, no sadness or fear. We left decorum within the suffocating walls of our bedrooms and found freedom in the obscurity of the ancient trees. We became one with the Earth somehow, my sisters and I, the moment the dancing began. Like some sort of ritual ceremony. Sometimes I would open my eyes just to watch them, chanting or humming or swaying or twirling, each consumed by the music, their cheeks flushed red. We danced as though we could keep away the sunlight, but dawn waited for no one. Eyes wild and glazed we would creep back through the brightening forest, back toward the manor, up the blanket hanging from our bedroom windows, and into the lives we left behind. During those final moments, as we switched ballgowns for nightgowns, and the forbidden thrill of our evening for the comfort of our beds, I couldn’t help but smile. In the corner of our bedroom by the door lay a giant pile, almost a full person’s height. 12 pairs of shoes, worn to the sole. This entry was posted on Saturday, November 12th, 2011 at 1:30 am	and tagged with dancing, fairytale, fantasy, princess, Retellings and posted in Fiction by Isabelle. You can follow any responses to this entry through the RSS 2.0 feed.